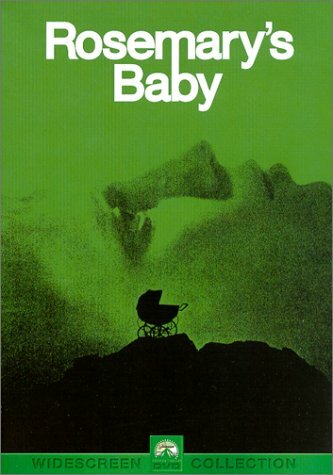 Adapted from a novel by Ira Levin and directed by Roman Polanski, ‘Rosemary’s Baby’ is a psychological horror movie which can now be regarded as a cult classic of the horror genre. The centre of the story is a young couple – Guy and Rosemary Woodhouse (John Cassavetes and Mia Farrow). After the couple’s move to Bramford, a gothic complex of apartment buildings in New York, strange occurrences begin to take place, and their elderly neighbours’ friendliness becomes too suspicious. When Rosemary gets pregnant, suspicions about people around her start to escalate, and the final question becomes: what is the truth here, and what is just a figment of her imagination? Those who rave about blood, gore and other similar “in-your-face” horror, ala ‘A Nightmare on Elm Street’ (1984/2010), may as well look elsewhere: the horror in ‘Rosemary’s Baby’ is subtle, and purely psychological. However, in no way this makes the film less intriguing or horrifying. On the contrary, as the danger in the movie is well-hidden, but, nevertheless, closer than one may think, psychological tension and a sense of disturbance is guaranteed. Horror induced by a mere thought of unthinkable happening beneath the facade of “ordinary” and “well-known” can be a truly frightening experience. It can reign over human faculties with a larger force than any ‘The Exorcist” (1973)-like explicit images can induce. The reason for this may be that psychological fear is all-and-ever present and constant, and only a specific film setting can achieve this effect. In this movie, Polanski manages to achieve this and much more. He builds the atmosphere of total uneasiness, discomfort and uncertainty, which is felt throughout the film, cleverly setting the right tone for the whole movie from the very first scenes, playing the eerie baby lullaby theme, featuring Mia Farrow’s voice. The atmosphere created in the movie’s key scenes is so full of doubt, wonder and apprehension, that it even manages to rival those found in the Hitchcock productions, for example in ‘Vertigo’ (1958). Betrayal, game-playing, manipulation and an acute sense of fear create conditions of total desperation, hopelessness and isolation. Dream sequences are also executed masterfully in the film, and are truly impressive (they can even make David Lynch jealous). What is also striking about ‘Rosemary’s Baby‘ is how true it stays to the novel: every detail, dialogue and scene are seemingly incorporated, and every other paragraph in the novel is visually reproduced. By working closely with the author throughout the production, the director captures the spirit, atmosphere and the very soul of Ira Levin’s narrative. In that way, the success of the film can be partially attributed to the success of the book because the whole premise of the novel is fascinating and thought-provoking. This also means that the film may require multiple-viewings to spot all the clues elaborated in the book in order to get the full picture. This is also where lies the essence of Polanski’s masterful, pitch-perfect direction. Incidentally, ‘Rosemary’s Baby’ is the second of three films of Polanski which deal exclusively with horrors encountered in cities’ apartment buildings, the other two being ‘Repulsion’ (1965) and ‘The Tenant’ (1976). The choice of the cast and acting are admirable. John Cassavetes and Mia Farrow ( the latter being then married to Frank Sinatra) are very good in their respective roles of Guy and Rosemary, but it is their nosy neighbours Minnie and Roman Castevet played by Ruth Gordon and Sidney Blackmer, which prove to be a more interesting set. Ruth Gordon (Minnie Castevet) won an Academy Award in the category of the Best Supporting Actress for her role, and rightly so. Gordon portrays eccentric, excessively curious, humorous, but also double-faced Minnie Castevet with an enviable amount of authenticity, charm and magnetism. As it is customary for the films of that decade, ‘Rosemary’s Baby’ is also relatively long, and may appear a real “drag” for the viewer at times. However, seeing the movie in the light of films produced at that time, this can hardly constitute a fault. Moreover, although the narrative may appear slow-moving, the film never feels completely tiresome, and the viewer’s interest in the story is constantly maintained. The end of the film may also feel like a disappointment, but, probably, more so for those who have never read the book, than for those who have been already familiar with the story. It was said at one point that the novel was written at the time when the “God-is-Dead” mentality and the so-called “Anti-Christ” talk were popular and widespread among people in the 1960s in the US (Stephen King), and, therefore, by now, the film long lost some of its relevance. Although this is partly true, we still see in ‘Rosemary’s Baby’ the themes that are fascinating for the audience no matter the time passed, for example the idea of a cult and its power over minds and bodies of its followers, see now ‘Marcy, May, Marlene’ (2011), and the well-familiar theme of “The Fall of the American Dream”, see now ‘Requiem for A Dream‘ (2000) and ‘Revolutionary Road’ (2008). Great review. I reviewed this last week and thoroughly enjoyed it. Pretty much every scene helps to create tension and make you question what’s real and whether Rosemary is losing it or not. It is lengthy but totally worth sticking with. I’m also really glad they didn’t show the baby at the end, it actually lets you wonder if there is anything wrong with it or if it’s still in Ro’s head. Thanks. That tension created reminds me of Hitchcock too; and I also liked the fact that the film made you question Rosemary’s state of mind – in that way it was cleverly put together. I think this thought-provoking element is exactly what the author, Ira Levin, tried to induce. I actually saw the film first, and only then read the book, and the script virtually follows the book scene by scene and word for word. Btw, the child is portrayed as a real little devil in the book with a tail, horns, “orange-red hair” and “golden-yellow eyes”. I haven’t read the book but was aware that Polanksi changed virtually nothing about it save for the ending. I think if they had shown the baby then it could have been a bit silly; this way we can make up our own minds what the it looks like. In my mind it’s just a normal baby, but they’ve clearly done something to it because Ro screams something like ‘what have you done to its eyes’, which makes the whole thing even creepier. I just watched this for the second time and I truly love this movie. Your review says it all! Great film for the season. Thanks! It is one of my favourites now. Freaky, freaky, freaky movie but one that also builds on it’s tension and gives us that shocking ending we all needed. Great review. Great review, this film is so atmospheric and full of surprises.